My boys are UT football fanatics. Their blood type is UT Positive. Just as orange as orange can be. And they come by it honestly. An inheritance that runs several generations deep. And oh, this year’s team speaks of so much promise. The boys wore jerseys everyday last week. Practicing formations out back and taking turns as Justin Hunter and Tyler Bray. ESPN Gameday didn’t have to drive all the way to Knoxville to predict Saturday’s top pick. My nine-year old could have told you…. The VOLS were going to win against the Florida Gators. Grant — now that boy gets “tearing-up” emotional about football. And at 6 PM on Saturday, 104,000 other people we emotional, too. Gut wrenching, ear-piercing, horn blowing emotional. 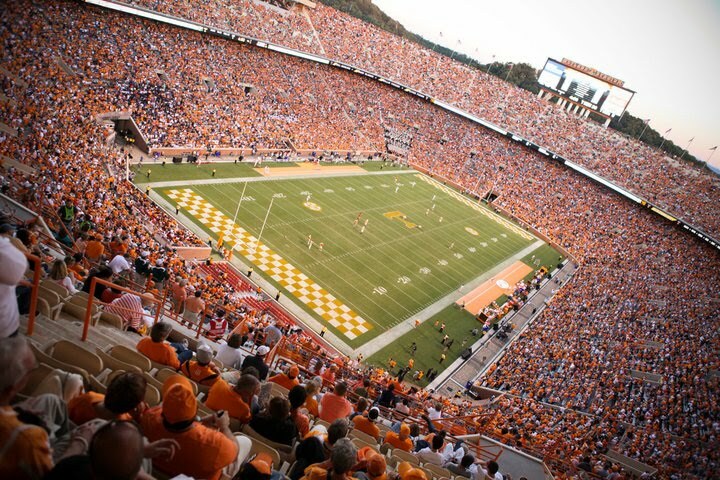 Neyland Staduim busted at the seams with orange enthusiasts. With belly’s full of chili, we took our places on the couch and sat in what would be our spot for the next three hours. We had waited a whole week (ahem, eight years) for this win. And I will be the first to admit …. The first three quarters, I thought we had it. We looked better. We played smarter. And we held the lead for most of the game. It was close, but I believed our passion was greater. But as the game went on, our team got sleepy. And seemingly curled up for a fourth quarter nap in an Alligator swamp. Florida was eating us alive. Orange fans had gone silent. Cameras scanned on disappointment and shaking heads. People filing out step by step. Saying goodbye to the dreams they brought in with them. But no disappointment could match the one to my right. My nine-year-old. Holding a bowl of popcorn. And holding back his tears. I held him as we looked on to the screen. Watching the last two minutes tick down our loss to the Florida Gators. Pointing to the game, “See all of those people there. You share a love for football with them, but really you share something else, too. God made you to be a part of something really big. God made you for Himself. Your love for this sport is a picture of that. Deep inside your heart is a desire for victory. You don’t just love football. You don’t just love to win. You love being a part of something bigger than yourself. That is how we are made. Cool, huh? Still wearing his jersey, he snuggled up with his Smokey Dog pillow pet. As I tucked him in, he leaned in for a forehead kiss. So today, we strap our pads back on, shake the dust off our cleats and head back to practice. Putting our hope in the safest place. In our only sure victory. If someone you know is struggling with defeat today, take a minute to encourage them. Pointing them to their victory in Christ. Becky, I bet Grant will remember your sweet words. I’m so thankful we have a God who won’t disappoint us! My eyes are upon HIM! I am so thankful, too Janet. Love your words. Love you.